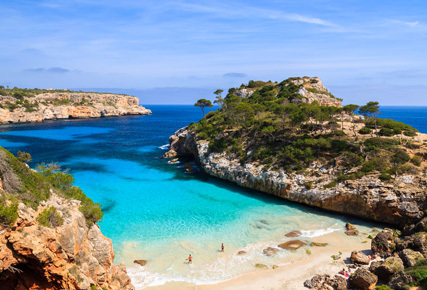 Located in the Southwest of Mallorca, close to Palma, the bay of Portals is offering a great opportunity to soak up the sun or take part in watersports along its well developed infrastructure. The perfect beach for a family day out! If you’re looking to get away from the crowds head west to the Cala Deia beach, here you will find a rocky hideaway with sparkling transparent water, perfect for watching the sea life in their natural habitat! If you're lucky you might see one of the many celebrities who own a holiday home nearby.